In the Pembrokeshire National Park you’ll find Cwt Gwyrdd, a meadow overlooking the river Bannon. 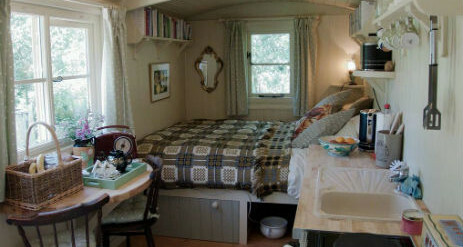 There is a Shepherd’s Hut, a Pod and a Bell Tent with a Bathroom Hut and a Camp Kitchen. Cwt Gwyrdd can be booked by 2-6 people in a single group. Guests have exclusive use of the site and facilities. It is a tranquil and sunny location perfect for romantic couples or small groups of friends. Children aged 8 and over welcome. Sorry, no pets. 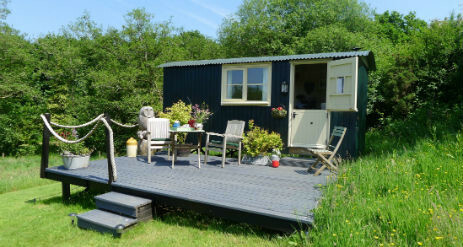 The Shepherd’s Hut overlooks the meadow and river and sleeps two in a double bed. 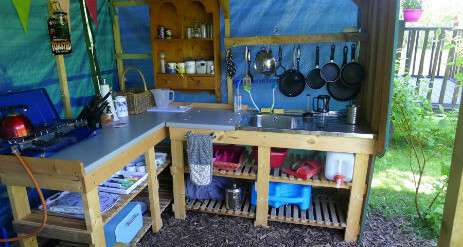 It has a small kitchen area with hot running water, a sink, cooker and wood burning stove. It is skillfully decorated and has a wonderfully cosy feel. 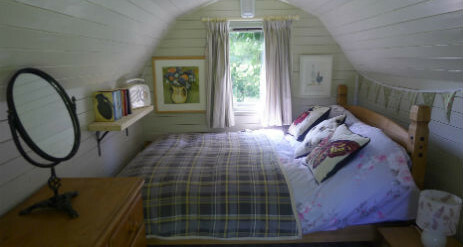 Our wooden “barn style” Pod sleeps two in a sturdy wooden double bed. There are drawers, a mirror and a bedside table. 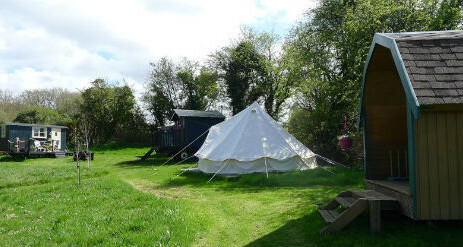 Our Bell Tent sleeps two in twin beds. 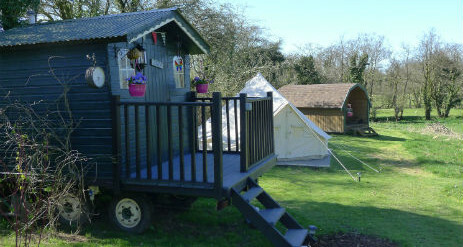 The tent provides additional accommodation for a group hiring the Shepherd’s Hut and Pod. See our website for full pricing options. The Pod and Bell Tent share a camp kitchen. There is also a shared bathroom hut with a hot shower, jug and bowl and eco toilet. Outside, you can lounge on the up-cycled benches or gather around the campfire with drinks as the stars come out. Fall asleep to the sound of the stream and wake to birdsong. The Shepherd’s Hut and Pod have electricity while the Bell Tent is off grid. The site has free WiFi and there is a mobile signal in most area. We are ideally situated inside the Pembrokeshire Coast National Park just 5 miles from the sea. An ideal starting point for exploring Pembrokeshire and west Wales. We are Greener Camping Club members and your annual membership (£10) is included in our prices. Visit our website for full details. Minimum stay 2 nights. Price per person per night decreases as number of nights and of people increases. Prices are slightly higher in July and August. Visit our website for full details.